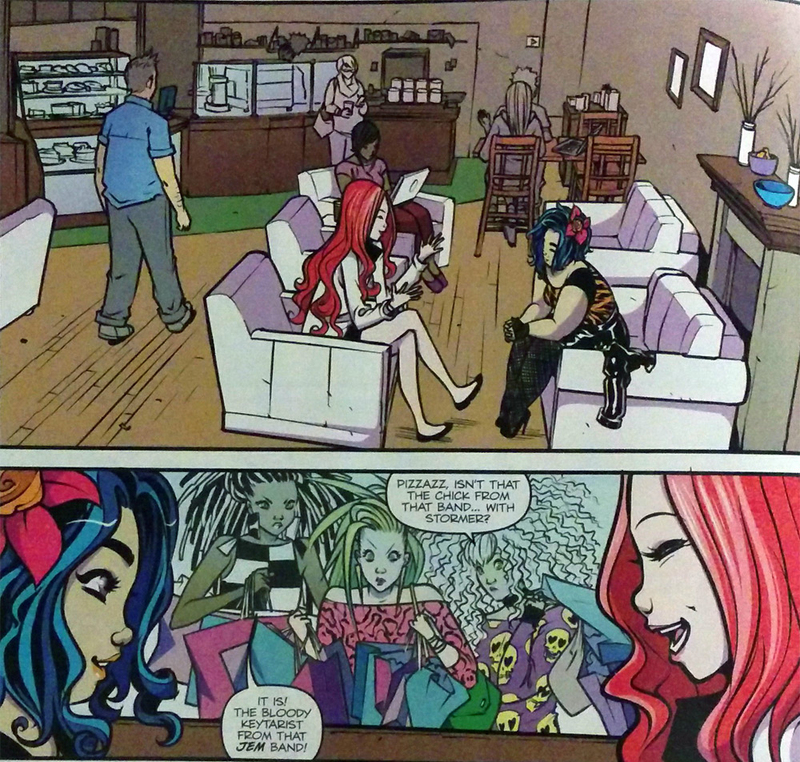 Spoilers: I talk about the first two issues of the new Jem comic near the bottom. 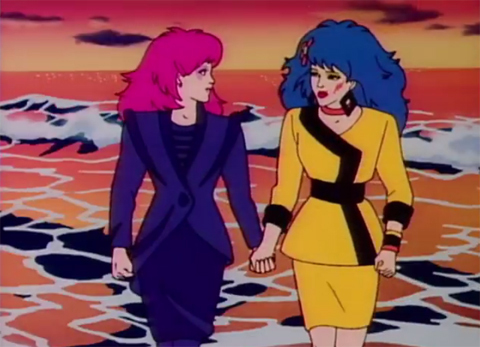 My favorite episode of Jem and the Holograms, “The Bands Break Up”, centers around the friendship between Stormer and Kimber… or is it something more than a friendship? (Yes. Yes it is so much more). Kimber and Stormer are both misunderstood and taken for granted by their respective bandmates (although the Misfits are just cruel to Stormer). They run into each other at some bar that serves ice cream and play hard-to-get before performing a song on-stage together and wowing the crowd, securing themselves a steady gig. Unfortunately, a shady promoter then tries to swindle Kimber out of her share of Starlight Music to transfer to Eric Raymond (the contract Kimber foolishly signs stipulates that if they don’t produce a hit record, she forfeits her share of Starlight). Stormer says the music they’re working on together is “Meaningful and sensitive. I’ve never done anything like it.” Is true love blooming? The duo has both bands worried, so The Misfits and Holograms crash one of their gigs trying to tear them apart. One line that sticks out in “Bad Influence” is Pizzazz with “She’ll break your heart in two”, directed at Stormer. Perhaps Pizzazz knows something about Stormer that isn’t blatantly stated in the series. Notable: Stormer keeps a photograph of her and Kimber next to her bed. Notable: I do, too. Stormer goes back to the Misfits when they distract her with a new car and credit cards, leaving Kimber hanging. But, Stormer ends up coming through for Kimber, recording her vocals and helping her to tell Eric Raymond to STFU. At this point, Kimber and Stormer realize they need help to complete the album, which the Holograms happily provide. They get their record out on the market and end up going platinum. I feel like a joke about Kimber and Stormer “Gettin’ Down to Business” would be cheap. But I’m still thinking about it. Just walking down the quiet, serene, romantic beach, holding hands in the sunset with my completely platonic– okay, they were so into each other. 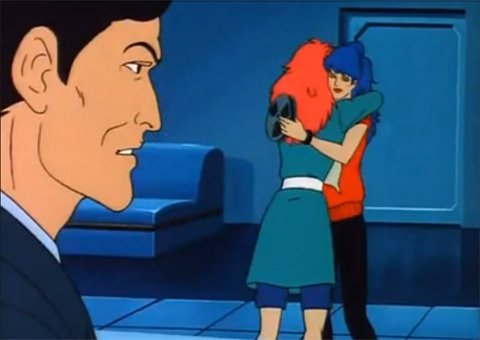 Jem offers Stormer a place in the Holograms, but the Misfits finally come in and admit they need her. She goes back to them, but not before embracing Kimber one last time. Could Kimber and Stormer’s relationship be something writers wanted to explore more on the show, but due to it being the 80s and a show geared toward children, were unable to? 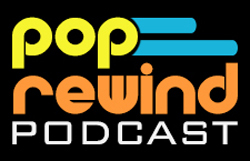 When I interviewed Christy Marx for the site a few years back, she mentioned an episode she wanted to do, but was unable to because Hasbro was not down with the content (concerning alcoholism). Either way, society is much different in 2015. 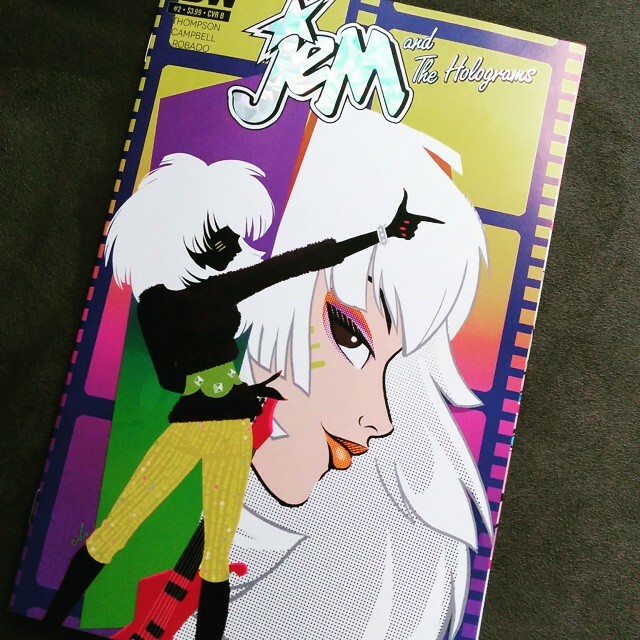 I was happy to pick up the first issue of the Jem and the Holograms comic book from IDW in March. Since it’s a first issue, it was difficult to gauge if I liked it or not. I could tell a lot of thought was put into it, harkening back to character traits and plots from the original series, but also updating it for a modern audience. Still, it was too early for me to tell. After I read the second issue, I was hooked. I completely missed (and in my defense, I’ve been actively avoiding spoilers for the comic and movie) this story on The Advocate in February where the team behind the comic book state that Stormer and Kimber are gay (although we’re not sure if that means Kimber is being re-written as a lesbian or maybe they misspoke/didn’t want to spoil too much. Kimber has shown interest in males in the original animated series, so she could be bisexual. I don’t know how in-depth this comic is going to get on the details). 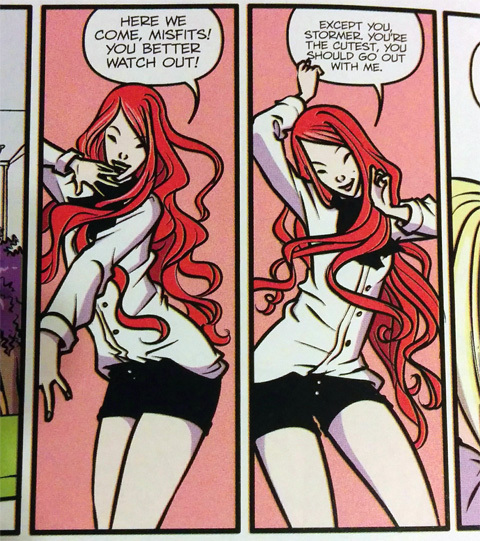 As I read the second issue, I was squee-ing all over the place at all the references to Kimber and Stormer. OK STORMER SO SMOOTH. You think you recognize Kimber from online stalking? omg I love you. Ohhh sassy Kimber. BUT OMG SQUEEEEE. And then they meet. And sassy Kimber takes Stormer on a coffee date. Gah. I can’t even. Thanks for summing that up, Internet video. 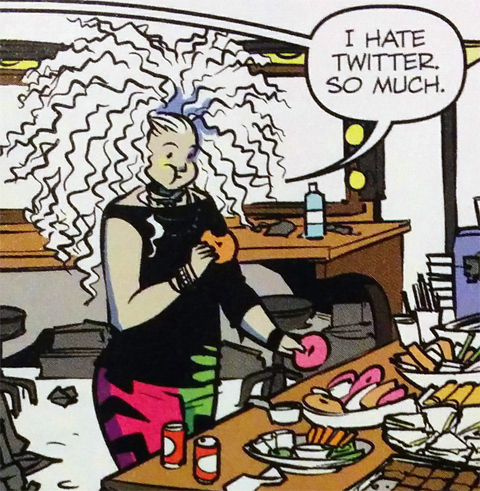 While only slightly off-topic, in the same issue, Roxy says “I hate Twitter so much”. Could this possibly be a reference to Roxy’s illiteracy? Or is it just another case of an individual feeling fed up with social media (been there, not a Facebook fan). Flip a few more pages to the bio section of the comic book and sure enough, Roxy’s deepest secret is that “She’s a high-functioning illiterate”. This is a storyline that was examined in the episode “Roxy Rumbles”. 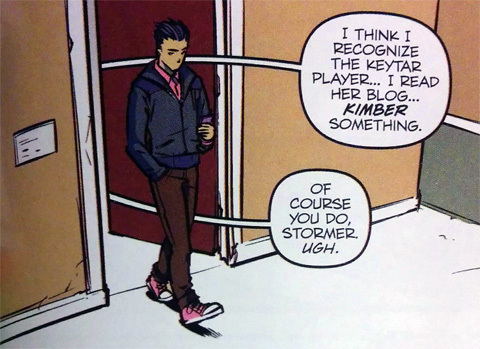 I’m eager to see how the comic treats Stormer and Kimber’s relationship, since they are OTP, but also curious to see what else they come up with if they’re delving back into Roxy’s illiteracy as well. 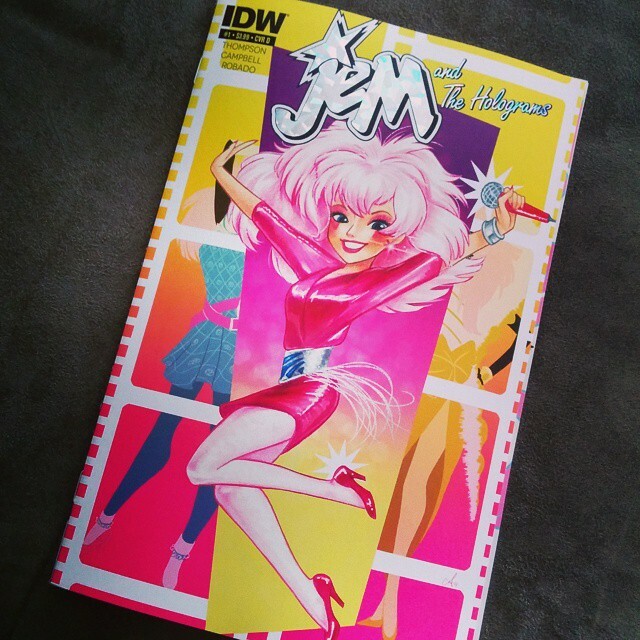 Have you checked out the Jem comic? Are you a fan of Stormer and Kimber? Great, great article. I LOVE the original JEM show and recently picked it back up on DVD after waiting SO many years for it to be re-released. 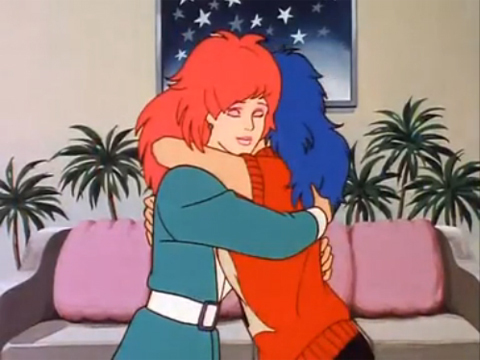 When I last watched through Jem about 3 years ago, I wasn’t really looking for something as specific as a relationship between Stormer and Kimber but now that you mention it I completely see it! I’m also really glad to hear that unlike with the movie, the writers of the comic seem to have done their homework on the original show. Thanks for this!